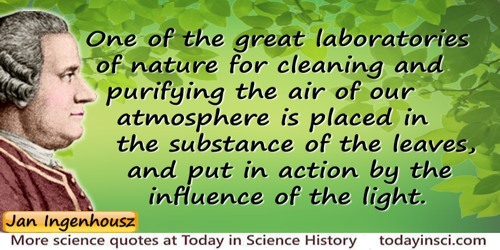 Dutch-English physician who discovered photosynthesis by identifying that sunlight gave green plants the ability to take in carbon dioxide, fix the carbon, and purified the air to the benefit of respiration of animals. 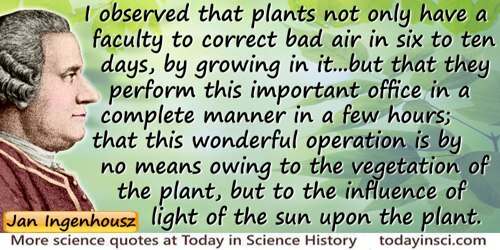 I observed that plants not only have a faculty to correct bad air in six to ten days, by growing in it…but that they perform this important office in a complete manner in a few hours; that this wonderful operation is by no means owing to the vegetation of the plant, but to the influence of light of the sun upon the plant. In Tobias George Smollett (ed. ), 'Experiments Upon Vegetables', The Critical Review, Or, Annals of Literature (1779), 48, 334. 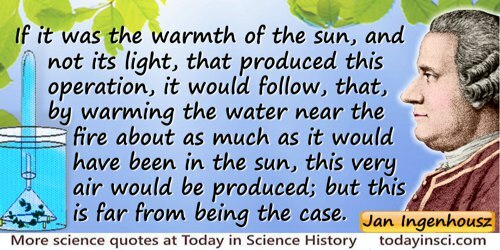 If it was the warmth of the sun, and not its light, that produced this operation, it would follow, that, by warming the water near the fire about as much as it would have been in the sun, this very air would be produced; but this is far from being the case. In Tobias George Smollett (ed. ), 'Experiments Upon Vegetables', The Critical Review, Or, Annals of Literature (1779), 48, 336. It will, perhaps appear probable, that one of the great laboratories of nature for cleaning and purifying the air of our atmosphere is placed in the substance of the leaves, and put in action by the influence of the light. 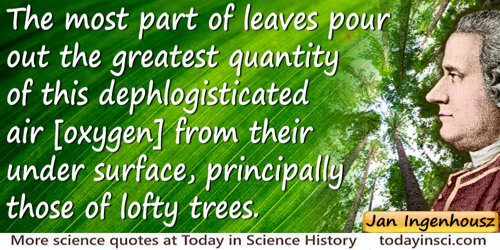 The most part of leaves pour out the greatest quantity of this dephlogisticated air [oxygen] from their under surface, principally those of lofty trees. In Tobias George Smollett (ed. ), 'Experiments Upon Vegetables', The Critical Review, Or, Annals of Literature (1779), 48, 335. 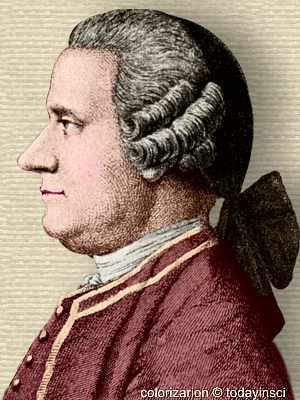 8 Dec - short biography, births, deaths and events on date of Ingenhousz's birth.